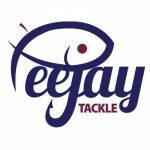 It’s been a great week for the blog as it flew past 400,000 hits but even bigger news is that Against Men and Fish has a new site supporter, regular readers will know I’m a huge fan of Bait-Tech products and I am over the moon to now be associated with them. 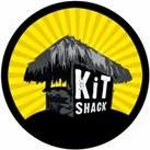 I look forward to bringing you details of new products, reviews and interviews with some of their stars. Right onto the last match of the Summer League and I have to say it’s not been a great series for me with just a few section wins to show for my efforts. The pond is fishing extremely well and we are seeing attendances grow week on week but I’m just not getting it right out there at the moment. Graham Field on the other hand is having no such problems and has won the league with a match in hand. He fishes the short pole to hand with maggot or pinkie hookbaits and catches an awful lot of small fish but the difference this year is that he’s started to catch some quality fish as well and has been averaging 20lb a match which is brilliant fishing. To give you an idea of Graham’s consistency, he’s picked up money in every round, has the two best weights with 38lb 5oz and 31lb, he’s won his section five times and hasn’t scored lower than two points. We were meeting at the pond again so I stopped off at Burger King to get a bacon butty only to be told they didn’t have any bacon! What a poor show and I hoped it wasn’t a bad omen for the day ahead. 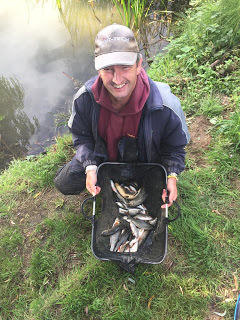 I got out the pond and there was another great turnout of sixteen anglers and after paying the pools and collecting my bait from Steve (cheers mate), it was time to draw. I went in fairly early and as always, I wanted to avoid pegs 1 or 24 and hopefully pull out a peg on the nearside. I opened my hand to see the number 15 staring back at me and my initial relief at avoiding the bush pegs soon turned to disappointment when I realised I was on the high bank with the fence right behind me – great! The leagues two most consistent anglers, Ash and Fieldy, drew two of the best pegs on the pond, 18 and 19 and they would be there or thereabouts again and as an added bonus neither would need to plumb up or change their Wi-Fi passwords from the last time they were here and I’m sure they would need directions if they ever drew a peg on the other side of the lake (but I’m not bitter, honest!). depth which would just make things even more awkward. It looks really nice but it’s a very awkward peg to fish, I’d rather of been on peg 16! After my last disaster out here I’d decided I was going to try and catch skimmers and bream on the pole today so when Rob blew his whistle at the 10:15 start time, I cupped in four balls of groundbait which was hard work with that poxy fence, I did find another use for my Bait-Tech towel though as I put it in the fence to ship my pole back over to stop it getting scratched. I started with caster on the hook and had a couple of half decent roach on the drop followed by two small ones so I switched to corn in a bid to avoid the nuisance fish. At 10:30, Bob on the next peg asked if we’d started yet as he hadn’t heard Rob’s whistle and thought I was joking when I said we’d kicked off ages ago! First put in with corn on the hook, the float sailed away after a few minutes but I missed it, next chuck I had a 3oz chublet followed by it’s twin a few minutes later. My next fish was a small rudd which I had to wait ages for and then I missed a couple of lovely slow bites in quick succession. Going into the second hour, I hadn’t put much in the net and already I knew I’d be miles behind Fieldy and Ash. I had a roach but was waiting longer and longer for indications and to be honest I’d had enough already but then the float slid away and the strike resulted in the tip bending right round and no elastic coming out! The line had wrapped round the pole tip! I shipped back really slowly with the tip rattling and slipped the net under a lovely 12oz tench. A nice fish but with 90 minutes gone I hadn’t caught 2lb yet and was going nowhere fast. I’d been feeding casters and hemp over the top and there were some good fish swirling for the feed and I couldn’t resist having a go so went out with the shallow rig and the missed bite madness began, all I managed over the next 20 minutes was two little roach and I wasn’t going to do any good if I carried on like this. 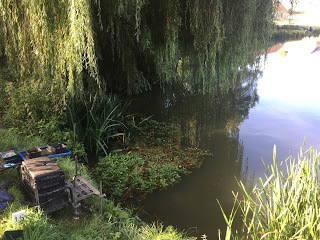 I was going to cup in some more feed and spend the rest of the match hoping the bream would turn up but had a quick go with the shallow rig just on the edge of the weedbed you can see in the photo above, about three sections out. I had a couple of small roach and then a gudgeon and was just about to give that up as a bad job when I had a net roach. Another followed quite quickly but any thoughts of bagging up soon disappeared when I went back to waiting for bites. I couldn’t really see the anglers to my left because of the willow tree and from what I could see the anglers on my right weren’t doing much and I started to think it might be fishing quite hard and if Ash and Fieldy framed per usual, there might be a chance of sneaking a section win. I found I would get a couple of good roach but then it would go quiet so I switched to fishing by the reeds to my right where I would get some tiny rudd but crucially it rested the left hand swim and allowed those big roach to get their confidence back. 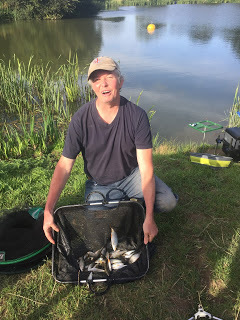 It certainly wasn’t fast and furious but I was getting some clonking roach up to 12oz and had another chublet and a 4oz perch and I thought if I could get to 80 fish I would have at least 10lb (if the fish averaged 2oz apiece) but probably nearer 12-14lb. As the match progressed I was beginning to enjoy myself and I was starting to wish I’d done this from the start. When Rob blew his whistle to end the match, my clicker was reading 80 fish although I’d also had quite a few tiny rudd which I hadn’t counted. 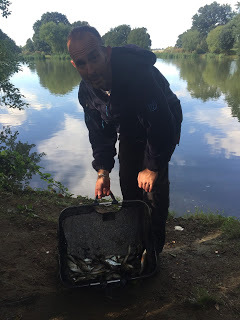 I packed up and took my kit back to the car before we all walked up to start the weigh in with young Stuart on peg 24, he’d caught loads of small fish for 7lb 8oz, his dad, Gordon was next and weighed a level 3lb from peg 22. 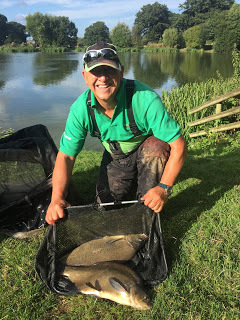 Then we got to John Dursley on peg 20 and he’d fished for big fish and struggled until he came short after watching Fieldy bag up and had two bream in two chucks! 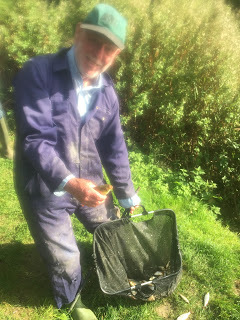 He weighed 12lb 8oz but also lost a big bream as well, then as we reached Fieldy, the usual antics started and he admitted to having 406 fish for somewhere between 5lb and 30lb! 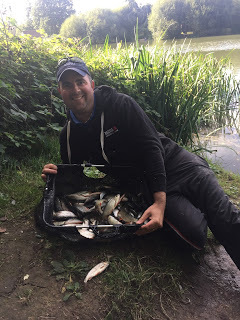 We weighed his two bream first which went 7lb 14oz and then the rest went 19lb 12oz which included a decent skimmer and a pound plus roach to give him a total of 27lb 10oz. Stuart had 7lb 8oz from peg 24 and nearly raised a smile! Ash was next and had a lovely net of quality roach for 18lb 8oz before Nick had 5lb 4oz from peg 17, then it was my turn and I thought it might be close between me and John but once again I was miles off when I weighed 10lb 8oz and that first hour and a half had probably cost me today. Last but not least in our section was Bob who had 2lb 8oz. I had some lovely roach for 10lb 8oz but got it all wrong yet again! 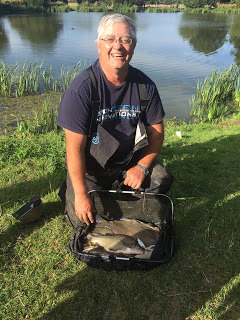 The other section arrived and Adie Bishop had the top weight with a nice net of skimmers weighing 17lb 8oz from peg 4 which put him third overall, Steve P had 11lb 10oz to win the section by default and take a nugget off me, Big Frank had 9lb 14oz and just behind him was Rob with 9lb 13oz. Karl had 5lb 10oz from peg 7, Rich S had 5lb 8oz and Terry had 4lb 10oz from peg 2. 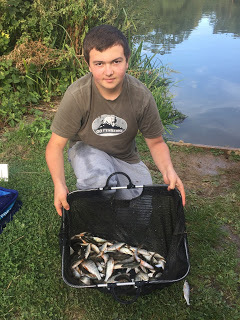 So as I said at the start of this post, Fieldy has been unstoppable and really has got it sorted at the moment, Ash has been super consistent and is very good at catching quality roach shallow, looking at his results, he fished eight matches and his lowest weight was 14lb (from peg 24) and his best match saw him catch 23lb from peg 20. As far as my league went, it never really got off the ground and I just seemed to be well off the pace every match and making the wrong decisions on several occasions has probably cost me a few section wins but I was never in danger of framing! To be fair, I haven’t drawn that well either and couldn’t get near pegs 17-20 which are my favourite swims and have been really consistent. 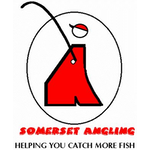 Before I go, the club would like to say a massive thanks to Rob for all his hard work organising another excellent league and also to the Royal Oak, Ilminster for looking after us so well and for their continued support and last but not least, all the anglers who fished one or more of the matches and helped make it a great league. 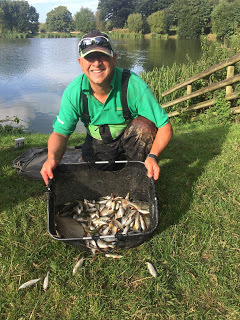 Over the ten fixtures we had 28 different anglers fish which is brilliant for the club and just goes to show that there is a healthy appetite for silverfish matches. Next week I’m back again for a pairs match with Hurf so make sure you come back to see how we get on.